“Museum Exhibition Design”, a six part series. Each week, I am writing a post about exhibition design. Last week was Part III, “Exhibition Design – Fabrication”. This week’s post will cover the phases of exhibition installation. Anyone who thinks that exhibition design is the creation of drawings to is only 1/4 correct. The process of exhibition design starts before drawing and continues through to opening day. I have been part of more than forty museum exhibition installations, including, Mexico, USA, Canada, Indonesia and Hong Kong. It is a stressful time, most people cannot read drawings and this will be the first time stakeholders will “see” the exhibition. As soon as the first crate rolls into the building, people will be excited and the comments will start; “I thought it would be red”, “I thought it would be bigger”, try to keep you cool and delay reactions to comments until the exhibition is 80% installed. Have a stakeholder preview scheduled and that will ease tensions. Exhibition installation can become very expensive, often exhibition installers bill out at $85 per hour or more, plus over time (after eight hours) and per diem. Changes to exhibits are now the most expensive, make stockholders aware during the fabricator review at the shop, better to make changes at the shop instead of during installation. My grandfather started out as a “window dresser”, creating window displays in New York City. “Window Dressing” as with exhibits, it is the details that make the difference, “do the lights point in people’s eyes”, “Are there unwanted details visible”, “Does the exhibition read as a whole, convey the big message?”, “Are there typos?”, “How do people use the space”. The last one “how do people use the space, is as much of an Art as a science, you can plan all you want, but people will always find new uses for spaces, test the space with a soft opening and watch people. Invite the families of the fabricators to come use the space and watch people, you will learn a lot. Partnership – Developed a good working relationship with the fabricator / fabrication team (if being fabricated in house). 1. Documents – Before the exhibits leave the fabricator, make sure you have reviewed the exhibition layout details and confirmed electrical and IT connections are in their proper places and ready for installation. 2. Load in and Staging – Work with the fabricator to detail which exhibits will be brought to the site first, how they will be loaded into the building and where they will be staged, prior to installation. You may need to work after hours to not effect open galleries. Confirm location of crate storage and modifications for next installation if a traveling exhibition. 3. Make Friends – Installers and the project manager will be a great resource six months after opening, make sure that you know their names and understand their day to day schedule during the installation. 5. Build in flexibility – It is much easier to have a review before bolting casework to the floor than after. More than once I have been asked to move casework already bolted in place, now I place exhibit components, gather the decision makers and get a “nod of approval”. During evaluation you may need to move exhibits due to evaluation feedback, always better to have exhibits built in a modular fashion. 6. Maintenance – Ask stupid questions, “how will we change the light bulb?”, “how do we clean the filters on the computers?”, often small details during installation make for difficult exhibit maintenance. 7. As Built Drawings – Make sure that “As built drawings” are included in the fabricator’s scope of work. During installation often layout, equipments or specifications can change, make sure the changes are documented as part of the installation process. 8. Keys, On/Off & Maintenance Manual – Often I will specify key numbers as part of drawing packages (it is a pain walking around with a ring of keys, key cabinets to be keyed alike), all of the items such as key numbers, equipment warranty and “as built drawings” should be compelled in a notebook for review prior to shipping. 9. One Year Warranty – I will only work with fabricators who will warranty their work for one year. Warranty should cover repairs do to defects, not abuse or misuse. A kid getting under an exhibit with a swiss army knife and making his own repairs is NOT a warranty item (it happened at LSC). 10. Evaluation – I know it sounds like you finished, but now the exhibition needs to be evaluated to assure that there are not misconceptions and that you are communicating the content with the visitor. Now the exhibition needs to be maintained to assure that you are communicating the content with the visitor. I had a great suggestion for a additional post about maintenance the next post will cover “Museum Exhibition Maintenance”. Then I will create a final post to tie together the entire process of museum exhibition design, including an executive summary and “check list”. 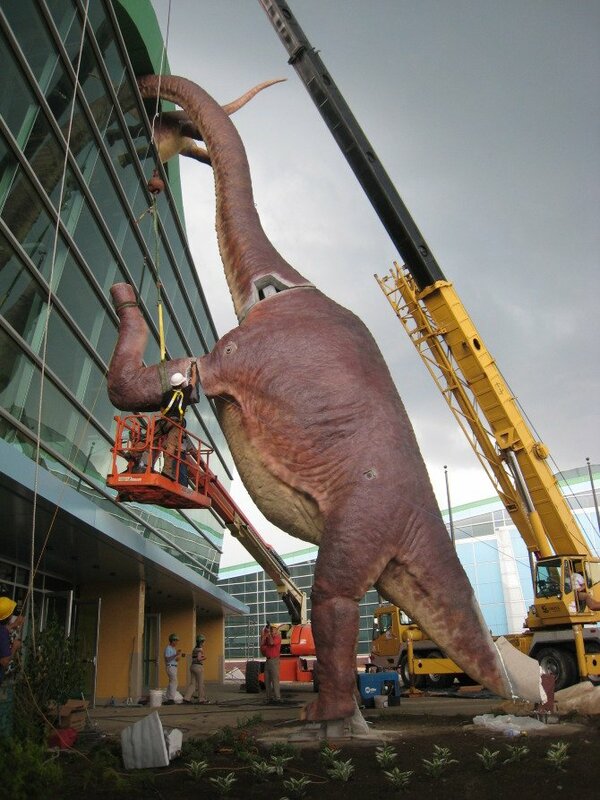 The image at the top of the post is from the installation of the Dinosaur and Dinosaur “baby” at the Children’s Museum of Indianapolis, I was the project manager of the dinosaur sculptures and the exhibition “Take Me There Egypt”.